Caterham produces a lightweight sports car and successful race car. Caterham cars had been massive Lotus Seven dealers during the 1960s, and its founder Graham Nearn purchased the rights to continue the manufacturing of the seven design from Chapman in 1973 after Lotus announces intention to discontinue the model. Caterham restarted the manufacturing process of the Lotus Seven series. When you mention a kit car to anybody that doesn’t really know what a kit car is if you mention the name Caterham or a Lotus 7, then they soon will have a picture in their head of what a kit car is, and they understand exactly what you mean. This is why when you go to kit car shows up and down the UK throughout the summer, there are masses and masses of Lotus seven look-a-likes and Westfield’s and lots of other sports cars that look like the Lotus 7. Caterham’s are built of aluminium sheet attached to a tubular steel chassis it’s nose cones, and wings are either fibre glass or carbon fibre depending on specification. All Lotus 7s are front engined and rear-wheel drive and have two seats. They have high performance, and this is achieved through being extremely lightweight normally less than 500 kilos on some versions and rather particularly powerful engines as well as the very light chassis and bodywork. Caterham’s and Lotus Seven’s are very quick because they don’t have the mod con’s, and without all the safety features a modern-day car would have. The lack of comfort and safety orientated features such as a fixed roof, doors, radio, air conditioning, airbags, and obviously, traction control, ABS and its cruise control. As a result, the Caterham is not really a practical car for everyday use even though I do know a few people who drive theirs every day. 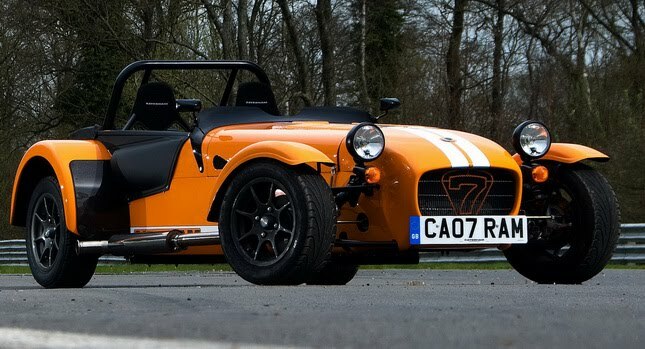 The Caterham kit car is an extremely liked car by a lot of kit car enthusiasts, and I have to agree with them, the outstanding performance and handling on and off the track which makes it great fun to drive and own. The Caterham design has been copied by many other kit car companies, and the reason is it is a fantastic kit car. Caterham has always been on the wanted lists with enthusiasts outside the UK and exporting the Lotus 7 to other markets is increasingly popular. However, safety and emission’s regulations of the modern-day has restricted the export of these fantastic cars which is a shame really as everyone should experience at least driving if not own one of these machines. In the United States, You can only buy the Caterham kit car as a kit, but you can pay for the supplier to build your Caterham for you may not be confident enough to put it together but still want to experience the thrill of driving and owning a Caterham. The Caterham in my eyes is still one of the best kit cars available its well refined and parts are easily and normally cheaply found. The engines interchangeable with whatever you want you can put a Ford VTEC engine in or even a Honda engine and as many people have done the old K-series. You see with kit car ownership it’s not always just about driving one it is about building, maintaining and improving your car. You can pick up a Caterham relatively cheap from many places online. No matter if you’re looking for a road registered road legal Caterham, or if you’re looking for a project, subsequently eBay is probably one of the best places to look. If you also wanted to buy one straight from the manufacturer, then you can do so by going direct to Caterham themselves. One thing is, that when you buy a part built a kit from eBay you have to kind of hope the person who you bought it from has done a reasonably good job so far, as you may find you have to pull the kit apart and start again so that you know exactly how the car was built. You also have to get over the problems and the mess ups the previous builder may have done. If you have any comments or questions, please contact us and will be more than happy to answer any questions.